On a recent trip to Georgia to visit family this last June we made it a point to check out the Georgia Aquarium, the largest aquarium in the western hemisphere. 8 million gallons of fresh and salt water combined make this the world’s second largest aquarium after China’s Ocean Kingdom recently took the reigns as the world’s largest. That knocks Okinawa’s Churaumi aquarium off the podium to 4th after Dubai. Okinawa’s aquarium was 3rd largest at the time of our visit in 2012. 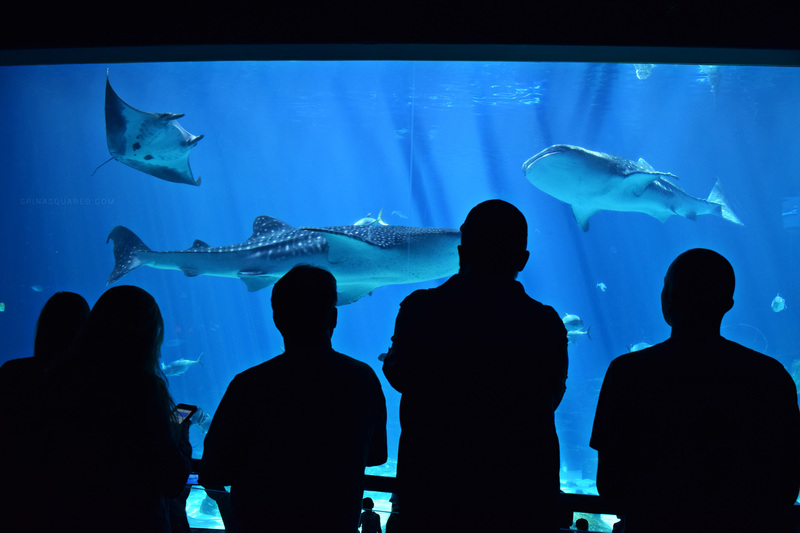 Built with private funding, the Georgia Aquarium sits on 13 acres of land donated by The Coca-Cola company and features 5 exhibits which separate the animals by region and their specific environments. The largest exhibit, the Ocean Voyager, contains 6.3 million gallons of salt water in a 284 ft × 126 ft area and is the largest indoor aquatic center in the world. The exhibit was designed around the four whale sharks they were importing (and saving) from Taiwan’s annual fishing kill when it was built in 2005. Two eventually died while in captivity and were replaced with two more just before a ban was placed on the capture of whale sharks. Georgia has the only exhibit outside Asia featuring these enormous yet gentle sea creatures. The Georgia Aquarium is also only one of four sites in the world displaying Manta Rays. “Tank”, a 440-pound green sea turtle resides at the Georgia Aquarium after being rescued and rehabilitated from a shark bite in the ’90s. You can find several Beluga whales in the Georgia Pacific Cold Water Quest exhibit. You might consider having something warm to put on as you walk through. We didn’t, and ended up rushing through the exhibit. If you ever find yourself with an afternoon to spend in Atlanta, the Georgia Aquarium is definitely worth a stop!